Chemical engineering has been influencing various areas of technology. It is one of the major engineering disciplines and is founded on the laws and principles of chemistry, physics, mathematics and life sciences. These laws make chemical engineering operations more practicable and chemical engineering makes provision for these sciences to be applied to the real-world. The engineering aspect of it is concerned with the methods used in the creation of new products from raw materials which are mostly natural resources. 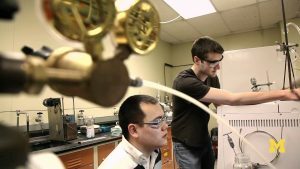 The main definition of chemical engineering or What is Chemical Engineering would depend on the one you choose, because there are various definitions. Chemical engineering is division and part of engineering that is concerned with chemical production and the manufacture of products using chemical processes. Chemical engineering is the transformation of raw materials using chemical processes to make them into useful products for public consumption. Chemical engineering is an engineering arm that oversees the operation of plants and machines, constructions and designs as well as chemical processes to manufacture useful products. Chemical engineering is a branch of engineering that relates with the physical and chemical transformation of matter in the production of compounds. Chemical engineering the scientific application of chemistry to industrial uses. Chemical Engineering is the branch of engineering that merges the knowledge aquired from chemistry with physics, maths and economics to tackle technical problems in the processing industry. Chemical engineering is a branch of engineering that deals with necessary processes like transformation, production, transportation and usage to produce useful materials and energy. In a more general term, chemical engineering is the application of sciences in the conversion of raw materials or chemicals into more usable products. It is also responsible for the maintenance, simulation, evaluation, construction, planning, optimization and operation of plants in the process industry. A chemical engineer does not just design processes, but they are capable of designing large-scale processes, which is one of the reasons they are highly placed today.